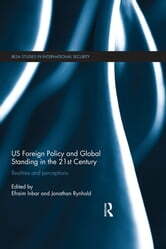 This book examines US foreign policy and global standing in the 21st Century. The United States is the most powerful actor in world politics today. Against this backdrop, the present volume examines how the foreign policies pursued by Presidents’ George W. Bush and Barack Obama have affected elite and public perceptions of the United States. By examining America’s standing from the perspective of different actors from across various regions, including China, Russia, Latin America and the Middle East, while also assessing how these perceptions interact with America’s own policies, this books presents a fresh interpretation of America’s global standing. In doing so, the volume evaluates how these perceptions affect the realities of US power, and what impact this has on moulding US foreign policy and the policies of other global powers. A number of books address the question of which grand strategy the United States should adopt and the issue of whether or not America is in relative decline as a world power. However, the debate on these issues has largely been set against the policies of the Bush administration. By contrast, this volume argues that while Obama has raised the popularity of America since the low reached by Bush, America’s credibility and overall standing have actually been damaged further under President Obama. This book will be of much interest to students of US foreign policy, US national security, strategic studies, Middle Eastern politics, international relations and security studies generally.